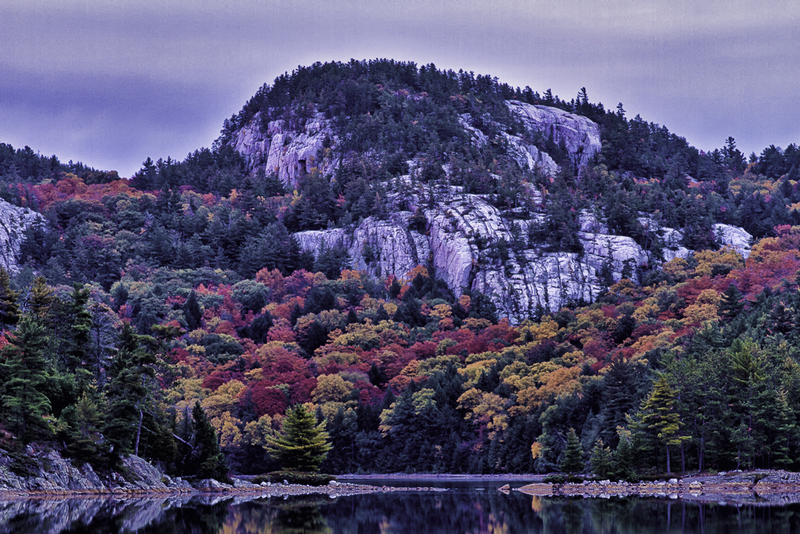 On my last trip into O S A Lake,Killarney Provincial Park the weather was cool,wet and windy.The above locations is one of my favourites for the structure of the La Cloche Mountains.This particular rock face had a necklace of Fall colours adorning it. It had stopped raining late that afternoon leaving the landscape wet and saturated.The cloud cover was heavy and grey.The sun had not come out yet. I used the two points as my lead in, showing just a touch of reflections in the foreground.This should make my good friend Bill Whittaker smile in regards to water and reflections.This is an ongoing topic we have.Past the two points is more water.There is a pink tinge on the rocks that gives a unique feel to the composition. Two days later there was large areas bare of colour due to the weather. I received an email that my artwork titled “Daybreak” has been selected as an Honorable Mention of the 2012 Landscape Art Contest, an international juried art competition. Mywork will have a full page feature in Artist Portfolio Magazine Issue 10. Bill Whittaker has a website you may like to check out. Well that is it for this week folks.Thanks for visiting and till next time happy trails. Hey Ken thanks for attaching my website. Owe you a coffee for sure. Beautiful. Makes me miss the east. Cheers from Alaska!